Danny McBride, as Kenny Powers, doesn’t seem much like a traditional leading man. He’s stout and stocky with a thick, tightly curled semi-mullet and complementing, par-for-the-course, jock-sanctioned goatee. He also curses in front of children, uses the people around him for his own gain and floods his body with recreational drugs and booze. 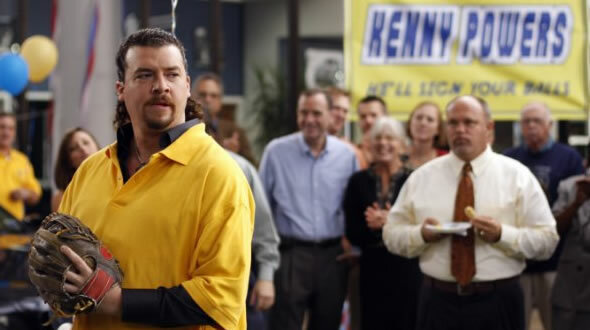 Incidentally, and perhaps not surprisingly, Kenny Powers has also become one of the most unique cult characters in modern television. He’s an inflated caricature of the fallen athlete whose reason for living isn’t to play the sport which made him famous, but instead to return to the cars, girls and drugs which come from the fame success in sports often provides. In short, he’s a figurehead for our time. Those who watch HBO’s comedy Eastbound & Down know can speak on the greatness of Kenny Powers. Those who haven’t, at the very least, have heard tell of him. If you belong to the latter group, allow me to catch you up to speed. In February 2009 a six-episode series began on the cable channel which focused on Powers, a former major league baseball pitcher whose complete self-destruction had reduced him to slinking back to his hometown of Shelby, North Carolina, where Powers moved in with his brother’s family and found work as a substitute P.E. teacher. Produced by Adam McKay and Will Ferrell (Anchorman, Talladega Nights and The Other Guys, not to mention the FunnyOrDie.com website) and written by McBride with film school buddies Jody Hill and Ben Best (a trio who also collaborated together for the small comedy The Foot Fist Way), Eastbound & Down presented the story of Powers as a deft, often straight-faced parody of sports redemption tales — only one which featured a hero so tremendously crass, brash and unlikeable you couldn’t look away. Throughout the course of season one, Powers was hired as a pitchman for a car dealership, let someone else take the blame for a drunk driving car accident, broke up an engaged couple, crashed a middle school dance high on ecstasy, lied to his family about a return to the major leagues and left his girlfriend holding her suitcase at a truckstop as he drove off into the sunset at the season’s close. Season two, which begins tonight, opens with Powers living “an outlaw’s life” south of the border and pitching for a small-time Mexican baseball league. The only returning character from season one, supposedly, is Powers’ protoge Stevie Janowski (Steve Little), Powers’ former band-teacher sidekick. The story begins fresh — which means if you missed the first season, it doesn’t matter. McBride has said in past interviews that he was a big fan of Ricky Gervais’ The Office (UK), which practically invented awkwardcore comedy, and also loved the way Gervais and partner Steve Merchant put together series with finite parameters and an end in sight. Ideally, the first season of Eastbound & Down was to be the only one, with six episodes of bringing Powers back to the top only to find out the top was a lie and leaving the (pro? )tagonist no choice but to dynamite another life for himself. The series was a massive hit, however, and roughly a year and a half later, chapter two starts this evening. Though I’m similarly a fan of Gervais’ abbreviated program style, I have to admit a great jolt of excitement when I heard the show would return. And I don’t think I was the only one. Eastbound & Down doesn’t seem to be in any danger of wearing out its welcome, if only because the minds behind it seem to have a smart view of what it is and where it should go. There’s very little chance that McBride and company will run this into the ground — more evidence points to the fact that it will be short and sweet, leaving behind a handfull of episodes which, much like the UK Office, will be passed around for years to come. Season Two of Eastbound & Down premieres on HBO at 10:00 pm on Sunday, September 26. Danny McBride, as Kenny Powers, doesn’t seem much like a traditional leading man.but no doubt an experienced man.